The Senior Gift campaign is a Lynchburg tradition. We, the class of 2019 Senior Gift Campaign Committee, will soon be asking you to think about what it means to be a University of Lynchburg graduate. It’s important that our class, like those before us, support our alma mater. The 2019 Senior Gift Campaign encourages every senior to make a gift, in any amount, to the University. 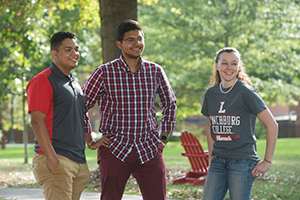 Donor support provides critical support for all students at the University of Lynchburg. Every year, thousands of alumni, parents and friends (and current students!) support the University. Many gifts are under $100, but when added together, these gifts are able to provide resources that students use every day. Your gift will help support scholarships, career development programs like Hornet-2-Hornet, learning tools like the Wilmer Writing Center, lab equipment, technology upgrades and much more. Make your gift in honor or in memory of someone special. Is there a favorite professor or staff member that you’d like to honor? Your gift can be made in honor or in memory of a special someone! How can you afford to give? The Senior Gift Campaign is about participation. Make a gift of $20.19 for the class of 2019, if you’d like. No matter how much you give, you’ll be helping to support fellow Hornets, now and in the future. How does your participation help the value of your University of Lynchburg degree? When you support the Lynchburg Fund, no matter the amount, you’re actually helping to invest in the value of your own degree. Alumni participation in giving is one of the key measures that various surveys such as US News & World Report consider when ranking colleges and universities. Your gift will help the University of Lynchburg continue to climb the rankings! Thank you to the Class of 2019 Seniors who made their gifts! Give today to the Senior Gift Campaign. Thanks to the Class of 2019 Seniors who made their gifts!